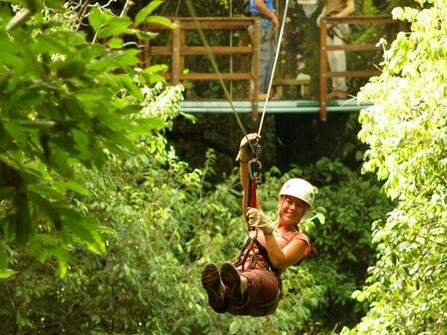 Self-drive two week holiday showcasing Costa Rica's highlights. This holiday is designed for families wanting to experience the wildlife, beaches, volcanoes, rainforest and cloudforest of Costa Rica with a touch of adventure. On this two week holiday you will hike through jungle and watch turtles hatching at Tortuguero, explore the Monteverde Cloud Forest, walk on Arenal’s lava fields, and zipwire through rainforest. You will relax in thermal springs in Arenal, and swim and surf on pristine beaches in Tamarindo and Manuel Antonio National Park. On arrival at the airport you will be met by our representative and make the 20 minute transfer to your hotel. The rest of the afternoon is free to recover from your flight amidst the attractive gardens and swimming pools of Xandari. If you want to stretch your legs, there is a lovely trail on the property to a series of impressive waterfalls. Today take a 3 ½ hour shared coach journey, stopping en route for breakfast, followed by a one hour journey by motorised canoe, to Tortuguero National Park. Arrive at your accommodation in time for lunch. 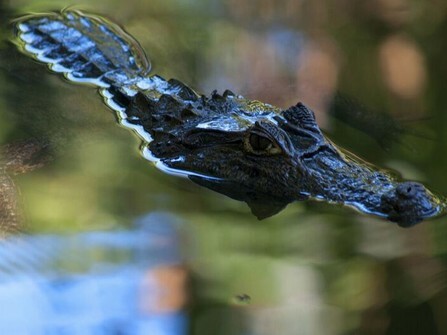 Known as the ‘Little Amazon’, Tortuguero is home to a strong concentration of wildlife, and during your stay you should have a good chance of viewing howler and capuchin monkeys, caiman, and macaws. Several activities are included during your stay at Tortuguero; these comprise a guided jungle walk, a visit to the local village and a boat excursion along the national park’s labyrinth of canals. Activities and transfers take place in small shared groups with other guests from the lodge. Today perhaps enjoy a guided hike in the jungle around the lodge and a boat tour along the national park canals. 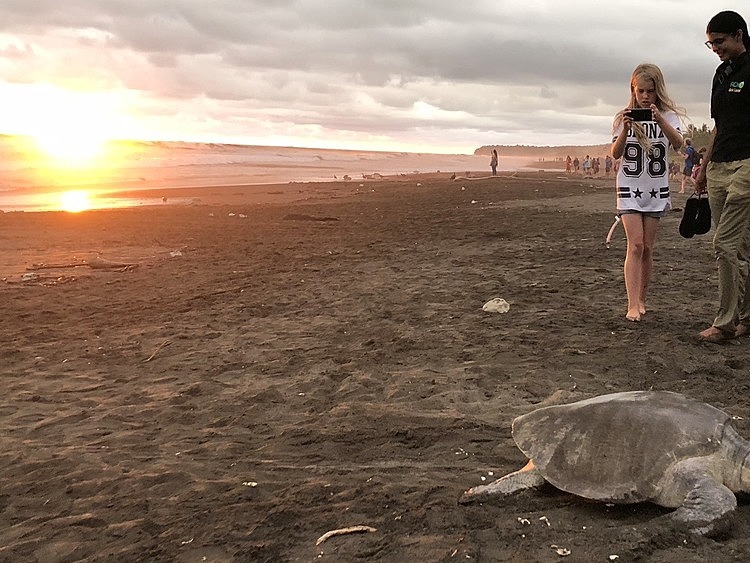 Tortuguero’s big draw for wildlife lovers is the turtle hatching and nesting season, which runs from late July to September. Although some stragglers might be seen during the day, all the action happens at night when hundreds of turtles emerge from the sea to lay their eggs in the sandy beach. If you are extremely lucky you might see the hatchlings emerge from their eggs and make their own way back down to the ocean. This activity is seasonal and subject to permit availability – note that allotted time slots may be in the middle of the night. Today take a one hour boat journey followed by a shared one hour road transfer to Guapiles. 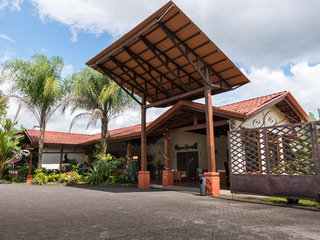 Here you can pick up your hire car before embarking on a two hour drive to Arenal. Arrive at your accommodation and enjoy the rest of your day at leisure. With your own car you can be free to explore independently and take your pick of the various tours and attractions in the area. In terms of activities, our highlights for families include the hot springs at Baldi, the skytrek zipwire, wild swimming at Fortuna Waterfall, hikes in the Arenal National Park (guided or independent) and rafting. We can book these activities in advance for you, or you can book these locally if you want to keep your options open. The quickest and most enjoyable way to travel from Arenal to Monteverde is by boat across the lake as this avoids the long and winding road round the water’s edge. The journey takes approximately two hours. 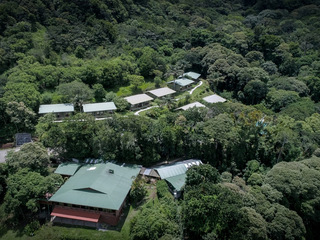 On arrival, enjoy an afternoon at leisure at the lodge, before setting out in the evening for an exciting night walk in the Monteverde Cloud Forest. This guided experience begins at sunset, when wildlife is at its most active. You will have the opportunity to hear and observe an impressive array of animals including sloth, coati, agouti, porcupine, and grey fox, along with numerous insects and hosts of sleeping birds. Founded in 1972, the 3,500 hectare Monteverde Cloud Forest Biological Reserve is internationally renowned for its dramatic biodiversity, and for its contributions to conservation and scientific research. Today you will hike through the well-marked trails, waterfalls, rivers, and observation areas of this prestigious reserve. Acclaimed as one of the ‘seven wonders’ of Costa Rica, the Cloud Forest’s geographical, topographical, and climatic conditions have spawned a remarkable diversity of wildlife. The reserve’s forests house numerous ecosystems inhabited by mammals, birds, reptiles, spiders, and insects, along with indigenous trees, plants, mosses, and tropical epiphytes and lianas. You may be lucky enough to spot the splendidly exotic Quetzal. Tamarindo is one of Costa Rica’s original surf towns, boasting a long sweep of golden sand and excellent beginner surf conditions. At high tide, Tamarindo beach is protected by a reef and offers lovely calm warm waters for swimming. Nearby Playa Grande caters for more experienced surfers. 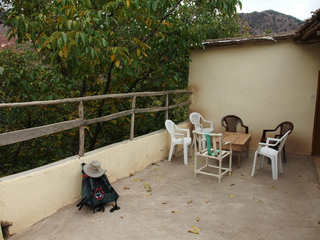 The town itself is a small, friendly tourist hub with plenty of restaurants, bars, and cafes. 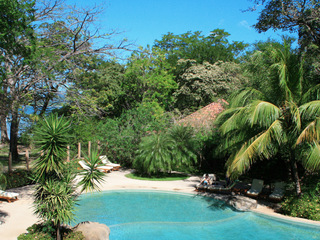 For accommodation, Hotel Capitan Suizo is our favourite option in Tamarindo. Offering mid/boutique level facilities, the hotel has a charming relaxed atmosphere with lovely gardens and its large, light and spacious pool has wonderful ocean views. The hotel’s location is excellent: ocean facing in a secluded, peaceful spot at the quiet end of the beach, whilst offering an easy walk into town in the evenings. Cala Luna is another lovely, perhaps more upmarket, option but for location and feel we prefer Capitan Suizo. Enjoy three days of sun, sea and surf on Tamarindo’s glorious sands. 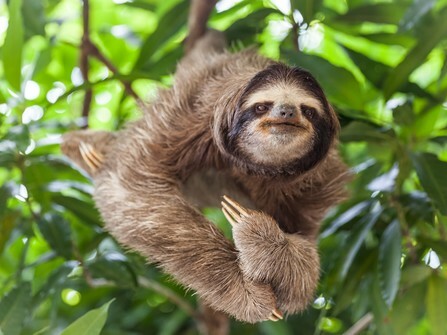 Today you will drive to Manuel Antonio National Park. It is a reasonably long journey, so we recommend starting early. Manual Antonio National Park is a small, busy, and incredibly picturesque national park with a fantastic density of wildlife, which pretty much guarantees monkey and sloth bear sightings. The park is located around a point, fringed on both sides by golden sand beaches. We recommend packing a picnic, hitting the park early or late in the day to avoid the crowds, and combining it with a cooling swim in the sea. Keep your eyes peeled for sloth bears, toucans, macaws and white faced monkeys. We have included a guided hike to give you the best chances of spotting the wildlife, or choose to explore independently on the well-marked trails. Today you will drive to San Jose to return your hire car, before your flight home. From the UK: Direct Flights with a flight time of approximately 11 hours from the UK to Costa Rica San Jose airport are offered by BA (Twice or thrice per week depending on season), TUI (once per week to Liberia, seasonal) and Thomas Cook (once per week to San Jose, seasonal). Direct flights tend to be considerably more expensive than indirect flights to Costa Rica. Indirect flights involving one stop in Europe, USA or Panama are available with BA, American Airlines, KLM , Norwegian, TAP Portugal, Air Canada, Delta, United, and Iberia offering overall flight times of between 14 – 22 hours. Competitive deals are often available with BA and American Airlines flying via Miami, with the option of combining your Costa Rica holiday with a stay on South Beach, Miami. Return flights range from £720 to upwards of £2,000, depending on seasonality and demand. Please get in touch for a detailed quote, including international flights from the UK. From the East Coast, United offer direct flights to San Jose, taking approximately 5 ½ hours, with prices from $515 return. Avianca fly with one stop and a 7 - 8 hour flight time, with prices starting at $370 return. From the West Coast, American Airlines, United, and Avianca offer a flight time of between 8 - 10 hours involving one stop. Prices range from $450 to $610 return. Please get in touch for a detailed quote, including international flights from the US. The family price for this sample itinerary is based on a family of 4 travelling together (and 2 adults travelling together for the couple price). Price includes all accommodation, transfers, car rental and guided activities where mentioned as included in the itinerary. 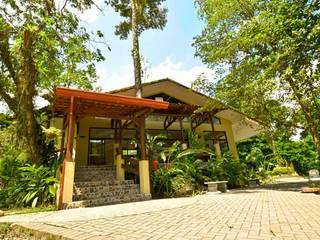 Accommodation is on a bed and breakfast basis throughout, with the exception of Tortuguero which is full board. Price is given as a guide and does not include international flights; actual quote will vary depending on the number and age of your children (if any), your travel dates and accommodation availability. Please call or enquire for a tailor-made quote including international flights. 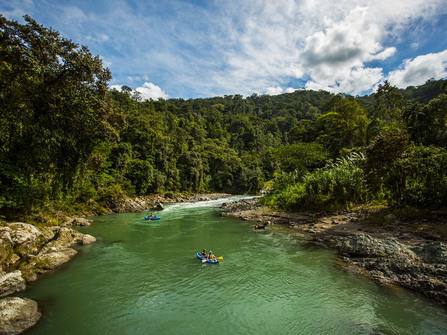 Costa Rica’s densely verdant terrain and sweeping rainforest owe much to its tropical climate. Generally, the country experiences its peak dry season from December to April, with May to November heralding the rainy or ‘green’ season. Rainfall can occur year round, although showers during the dry season tend to be short lived. December to April: Peak visitor season: beaches and national parks are busy, and accommodation is in high demand. Most of the country enjoys plenty of sun and high temperatures, with minimal rainfall. The Caribbean Coast is usually at its driest during March. Wildlife viewing is generally excellent, including whale watching at Uvita from December to March. May to August: The green season begins, bringing frequent showers to most regions. National parks see a slowdown in visitors, allowing crowd-free wildlife viewing, and surfing conditions can be good on key beaches. 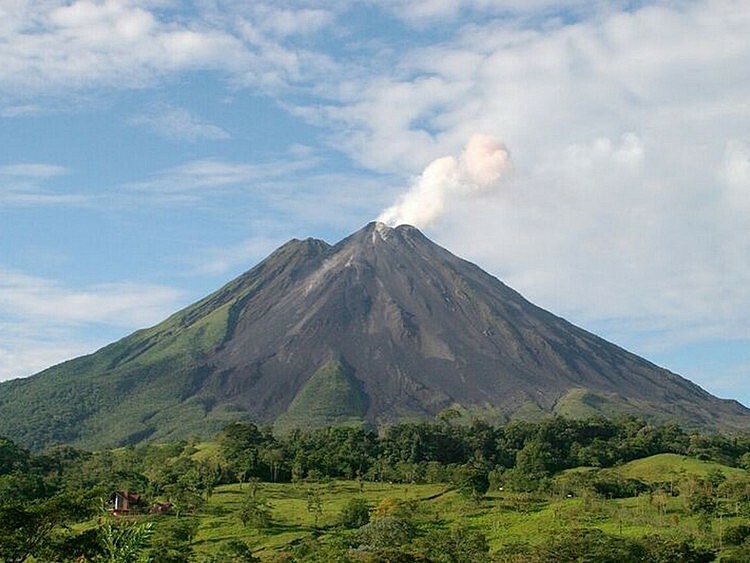 May and June can be good months to visit Arenal, when good visibility permits great views of the volcano. There are sunny periods in the Central Valley areas of San Jose and Manual Antonio National Park, and on the Caribbean Coast, where green sea turtle nesting along Tortuguero’s coastline is at its peak during July and August. July heralds the start of whale watching season at Uvita on the Southern Pacific Coast. The Northern Pacific coastline, including the Nicoya Peninsula, receives less rainfall year-round than the country as a whole, and often basks in sunny spells during July and August. September to November: The height of the rainy season, with prolonged heavy rain showers and storms sweeping most of the country, and resultant sea swells bringing great surfing conditions along the Pacific Coast. Tourist accommodation may be closed, and roads in rural areas can be off limits, due to flooding. The Caribbean Coast, hot and humid for most of year, is usually at its driest during September and October, coinciding with the end of turtle nesting season. The Uvita whale watching season reaches its peak during October. In November the rains begin to abate, allowing low-season uninterrupted wildlife watching for nature lovers who don’t mind the odd shower. By the end of the month, visitor numbers are on the increase again. This holiday is part of our Classic portfolio of itineraries which are designed to hit all the key highlights of a country in two weeks. As such, this is designed for families wanting to experience a bit of everything in Costa Rica: from the turtles of Tortuguero to the beach and surf at Tamarindo, from the volcano and activities at Arenal to the cloudforest at Monteverde, and the sloths and monkeys of Manuel Antonio. We have designed this as a self-drive itinerary as we think it is easy and certainly more affordable to self-drive in Costa Rica. If you prefer we can quote to include private transfers instead. We have alternative Costa Rica itineraries for families who surf, families looking for the very best levels of luxury and accommodation, and for families with a passionate interest in wildlife.